Thanks to a book by Elizabeth Yates McGreal, Amos Fortune is Jaffrey's most widely known citizen. Born in Africa, he came to Massachusetts as a slave and became proficient as a tanner. He obtained his freedom late in life and resesttled in Jaffrey when in his early seventies. He prospered here as a tanner and was a respected member of the church and active in town affairs. He died in his 91st year and is buried with his wife, Violet, in the Old Burying Ground, their epitaphs composed by the Rev. Laban Ainsworth, Jaffrey's first minister. His name lives on, not only in Mrs. McGreal's Amos Fortune Freeman, but in the summer lecture series, the Amos Fortune Forum, which is held on Friday evenings in the Meetinghouse. A state historic marker on Route 124 near Thorndike Pond Road commemorates Amos Fortune and another well-known Jaffrey person, Hannah Davis. 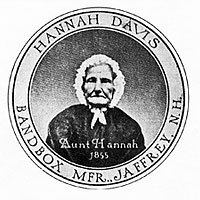 Hannah Davis was born in 1784 and grew up in Jaffrey. She developed a technique for producing bandboxes, which were the carry-all of an earlier era. She made these from a wood veneer and covered them, inside and out, with colorful wallpaper. They are very much in demand by antique collectors. She would travel by wagon to the mills in Lowell and sell her wares to the millgirls. Her house still stands at 102 Main Street. 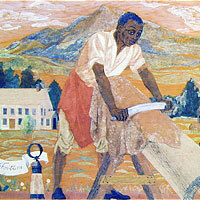 Examples of her work may be seen at the Jaffrey Historical Society and at the Melville Academy museum. She and Amos Fortune are commemorated on a state historic marker on Route 124 near Thorndike Pond Road. 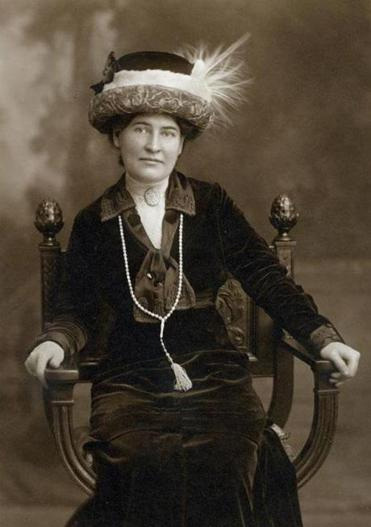 The prominent American author Willa Cather had a long association with Jaffrey. She first visited in 1917 and returned many times, usually in the autumn, through 1940. She would stay for several weeks at a time at the Shattuck Inn, which stood for many years on Dublin Road not far from Jaffrey Center. She worked on several of her important novels here, often in a tent set up in a nearby field. Her book One of Ours was inspired by the World War I diary of Dr. Frederick Sweeney, the local doctor. Willa Cather died in 1947 and although she hadn't been to Jaffrey for a time, she had had such a deep feeling for the town that her wish was to be buried there. Her grave (and that of her friend and longtime companion Edith Lewis) may be found in the southwest corner of the Old Burying Ground. A quote from My Antonia is inscribed on the gravestone. A fascinating episode in Jaffrey's history is the unsolved murder of Dr. William Dean at his home in August 1918. Whether the crime was connected with World War I and German signal lights has never been resolved. 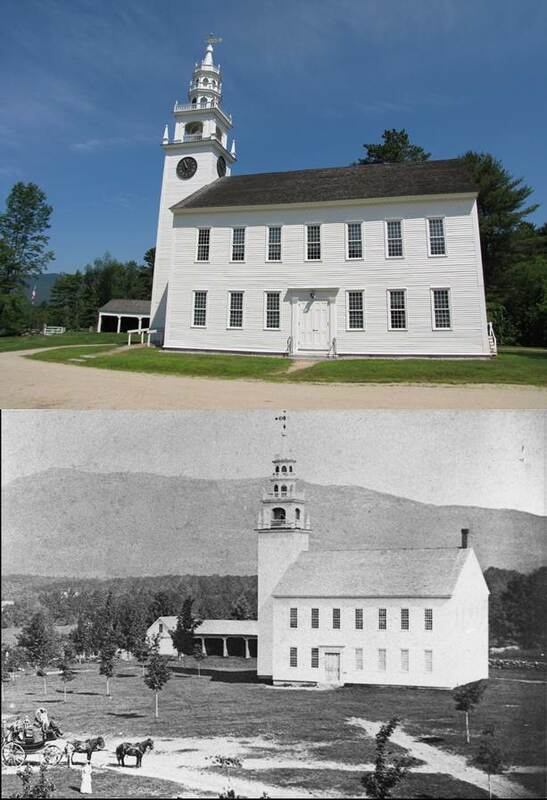 The Jaffrey Meetinghouse, which stands on the Common in Jaffrey Center, was described by town historian Albert Annett as Jaffrey's 'dearest possession.' It is unquestionably the town's oldest, most distinguished and best loved building. Its frame was raised on June 17, 1775, the day of the Battle of Bunker Hill. The workers toiling at their task that day could hear the noise of cannon in far away Charlestown. For many years it was used for both religious services and town meetings. In 1822 the tower and bell were added, and in the early 1900s the clock was installed. 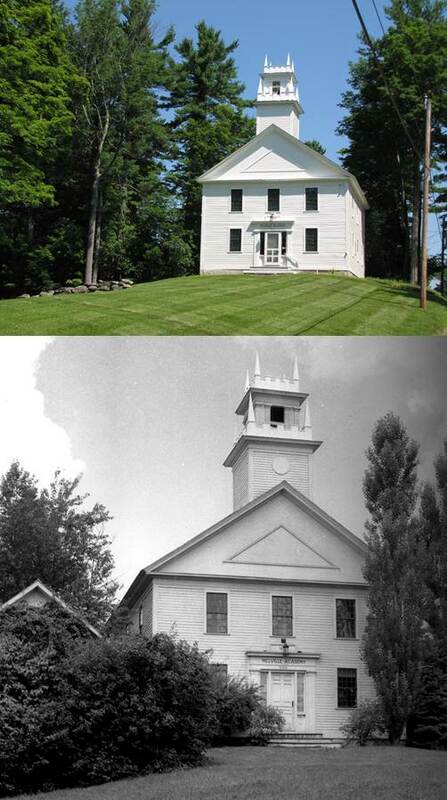 At one time the Meetinghouse accommodated the town offices and Conant High School. A major restoration in 1922, in time for the Jaffrey's Sesquicentennial, resulted in the present interior layout. Today the building is used for concerts, lectures, fairs, weddings, meetings and the annual 4th of July reading of the Declaration of Independence. The adjacent Horsesheds date to 1808 and behind these is situated the Old Burying Ground, a guide to which is attached to the west end of the Horsesheds. What was once Schoolhouse No. 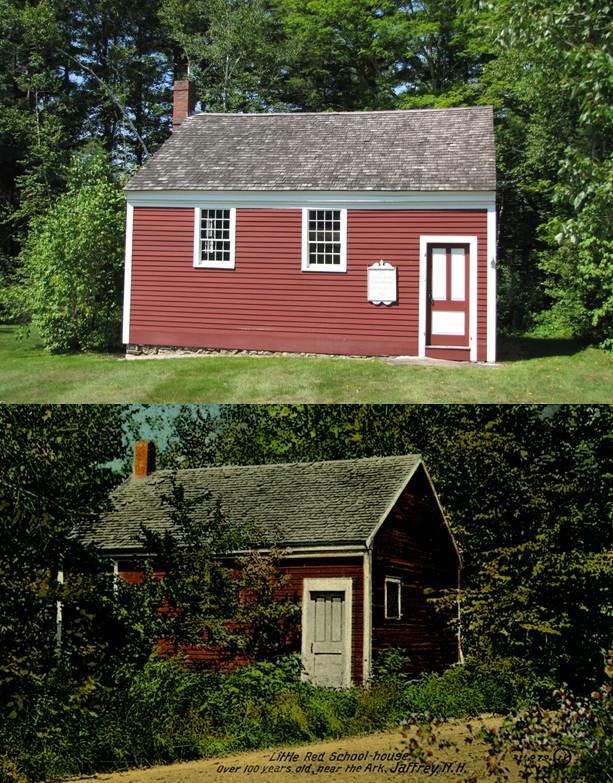 11 - the last of Jaffrey's one room schoolhouses - stood alongside Dublin Road from the time it was built in 1822 at a cost of $200 until 1960 when it was moved to its present location close to the Meetinghouse on the Town Common and restored by the Jaffrey Historical Society. It is furnished authentically with benches, school books, a blackboard, globes and a tall schoolmaster's desk. It is open on weekend afternoons during the summer from 2 to 4 and at other times by arrangement. This Greek Revival school building on Thorndike Pond Road was built in 1833 as a private academy, the major benefactor and investor being Jonas Melville. It flourished for a time - in 1835 there were 174 pupils equally split between boys and girls - but financial pressures led to its closing, and in 1863 it was taken over by the Town as Schoolhouse No. 7 and used as such until 1918. It sat vacant for a time until the Village Improvement Society asked permission to make use of it as a meeting place and local history museum. The Society did extensive restoration and on August 4, 1920, a grand opening was held with some of the former students in attendance. Actual ownership was transferred to the Village Improvement Society in 1960 after a Town Meeting vote. Melville Academy has an extensive collection of artifacts, tools, photographs, clothing, signs and even the old Jaffrey Center Post Office postboxes. Melville Academy is open free to visitors on summer weekend afternoons from 2 to 4, and at other times by arrangement. The Jaffrey Mills complex was built in several installments beginning in 1868. 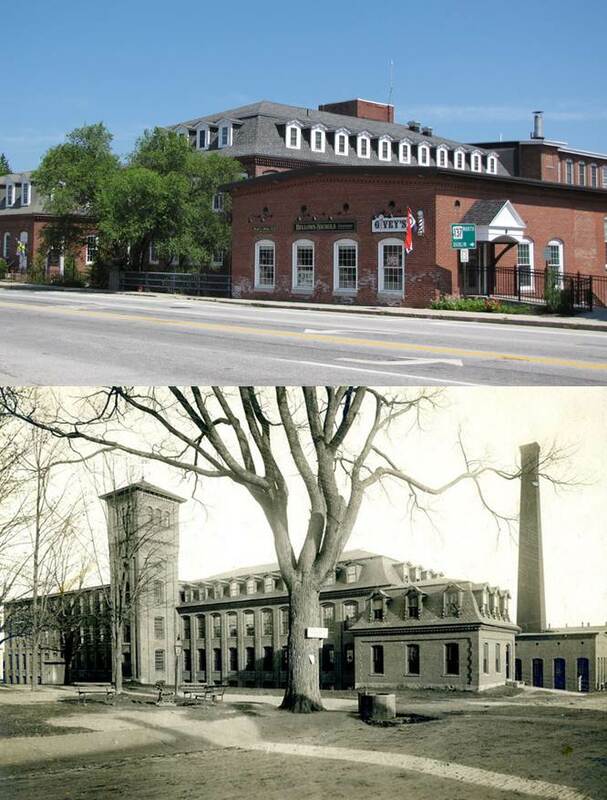 In the earliest portion at the corner of Main and North Streets, Alonzo Bascom, a local mill entrepreneur, chose the fashionable Second Empire style of architecture for what was soon - and for many years remained - Jaffrey's largest industry. Between 1872 and 1939 more than 3,000 miles of denim cloth were manufactured here. The tower is missing its top; originally there was an open cupola and steeple, while a later version resembled a Tuscan campanile. Today the complex houses the local School Administration and several offices and other uses. Rehabilitation of the portion west of the river for housing is currently being planned. The Jaffrey Mills is the only property in Jaffrey that is individually listed on the National Register of Historic Places. The building at 19 Main Street may appear somewhat odd. What looks like a house on top is indeed a house that dates to the early 19th century. It was lifted up in 1914 to allow for a storefront to be inserted. In 1929, the attached barn was converted to a movie house and later expanded. It was known as the Park Theatre and continued in operation until 1972. It has recently been purchased by a local non-profit group and plans are being developed for its redevelopment as a regional theatre, performance and meeting space. What started as a gift for the people of Jaffrey by Marion Mack Johnson in 1966, has become, forty years later, a gem for the entire Monadnock region. It is here that annual art exhibits, various classes, and meetings are enjoyed throughout the year. All art exhibits in both the first- floor Auditorium-Gallery, the four Display Cases, and the second floor Cunningham Gallery are free to the public. The comfortable first- floor non-lending Library offers extensive reading and research materials in the interests of ornithology, plants, artists and art history, crafts, Jaffrey genealogy, and the classics. The Center is also the headquarters of the Jaffrey Historical Society (see listing below.) Center hours are: Tuesday 10-6, Wednesday-Friday 1-5, and Saturday 10-2. All events are announced in the local media, and more information can be found by calling 532-6527. 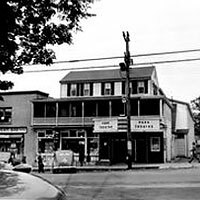 The Jaffrey Historical Society was founded in 1958 by a group of citizens concerned about the loss of some of the town's historic buildings and the lack of an appropriate depository for documents and artifacts associated with the founding and development of Jaffrey. The Society's first project was the salvaging and restoration of Schoolhouse No. 11 which is now referred to as the Little Red Schoolhouse and stands on the Common by the Meetinghouse. The Society owns the Old Fire Station on Main Street, now a fire museum. Meetings are held at the Jaffrey Civic Center which also houses the Society's archives and historical rooms. Among the items on display are farm implements and tools, country store fixtures, Hannah Davis bandboxes, old signs, clocks and paintings. 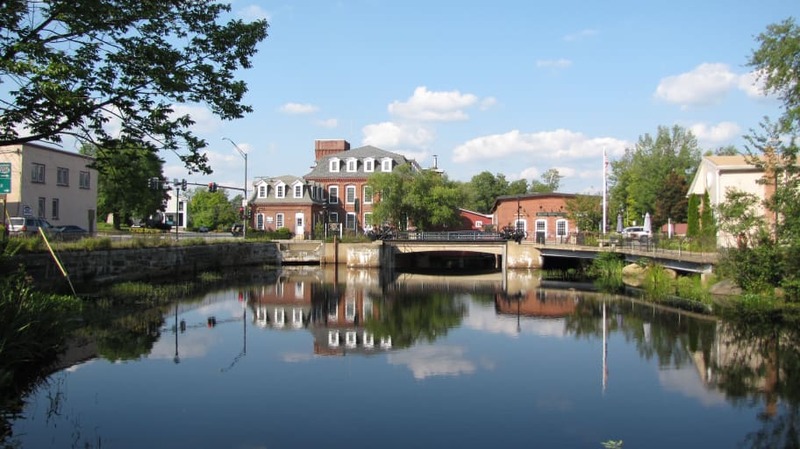 This pleasant riverside park in the center of downtown Jaffrey was developed on the site of a former gas station as a memorial to those who served in the Korean and Vietnam wars. It was one of the first such memorials to be built in New England and was done entirely though the efforts of individuals, organizations and businesses. It still is maintained by a committee of interested citizens. Designed by local architect, Bissell Alderman, it was dedicated in 1984. The two granite slabs standing at the entrance were once the steps to the Baptist Church which was demolished to make way for the present post office in 1968. 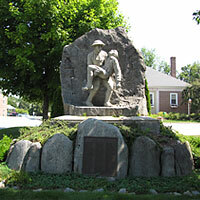 The Buddies Monument on Main Street commemorates Jaffrey involvement in World War I. It was carved in place on a large boulder that had been transported to the site from the western part of town. The sculptor was Viggo Brandt-Erichsen, a Dane whose wife had a Jaffrey connection. The memorial plaque at the base lists the 104 Jaffrey men who served in the War. The dedication, on Armistice Day, November 11, 1930, was attended by hundreds from throughout New England. 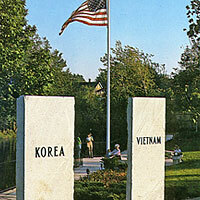 In 1949 Brandt-Erichsen created the Gold Star Mothers Memorial at the opposite end of the common which names the nine Jaffrey men who died during World War II. Also in the common - officially called Memorial Park - is the town Bandstand. This is the third one at this site. It had been removed some years ago but was returned and restored in 1986. It hosts summer concerts and other events during the year. 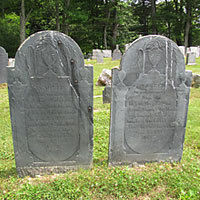 There are four active public cemeteries in Jaffrey which are interesting to visit because of their special character and setting, the gravestone art that can be admired or the locally famous resting therein. The Old Burying Ground behind the Meetinghouse and the Horsesheds is the town's oldest and contains the much-visited graves of Amos Fortune and Willa Cather. At the other end of the Jaffrey Center village is the Cutter Cemetery, memorable for its ancient maples. In the western part of Jaffrey, off Fitzwilliam Road, is the Phillips-Heil Cemetery; look for the granite chair of J. Ross in the shady and mossy older section. The largest cemetery is off Stratton Road and is named for John Conant whose grave, encircled by a cast iron fence, is in the center. 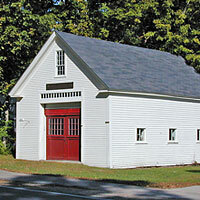 On the north side of Main Street in Jaffrey Center stands the Old Fire Station which was acquired in 1907 and served the western part of town until 1954. It is now owned by the Jaffrey Historical Society and is operated as a fire museum (open occasionally and by appointment). Its earliest piece of apparatus is the Fire Fly, a hand pumper which dates to 1828 when town's fire company was established. Also on display is The Contoocook, a circa 1835 hand pumper, and Jaffrey's first motorized pumper, a 1931 Seagrave. Walking tour guides of for a Walk around Downtown Jaffrey and a Walk around Jaffrey Center may be picked up at the Jaffrey chamber office at 7 Main Street. Note: For more information of on Amos Fortune, Hannah Davis and the Dean Murder, please visit the Jaffrey Public Library.